To the right is what is probably the most reasonable solution to the HomonimoKakuro puzzle presented in the last issue. If you find it at all intimidating, please read no further lest you permanently damage your obviously weak psyche. The unmitigated horror that lurks, skulks, and lies in wait below is not for the faint of heart, the weak of will, nor the socio- of -linguist. Each of these PuzzleMeisters will receive a SpecGram magnet of their choosing for their successful efforts. As we mentioned last time, the Linguistic Puzzle Elves™ have been on vacation for a good while, so we’ve run out of clever new Linguistically-Themed Pseudo-Nihonese Puzzle types for the time being. Thus we are going to bring out some fantastic new puzzles of a fantastic old kind that you may have seen before in these fantastic puzzle pages. We thought we’d kick off this next phase of the SpecGram puzzle series with a punishing bruiser of a LingDoku that will likely as not instantly melt your Wernicke’s area should you be so foolish as to even attempt it. For the present ginormous Monster LingDoku, you will face three simultaneous overlapping sudoku-style puzzles that you must solve and then integrate—all of which revolve around the Korean Hangul writing system. 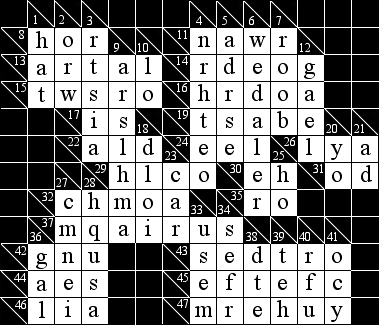 The first puzzle is essentially a normal 9x9 sudoku based on nine of the initial jamo of Hangul. The second puzzle is another 9x9 sudoku based on nine of the medial jamo of Hangul. The last puzzle—and you really should have been able to see this coming from a mile away (possibly only a kilometer away if you use the metric system and are not a native speaker of English)—is yet another 9x9 sudoku based on nine of the final jamo of Hangul. These three sudoku puzzles have been layered on top of each other in a single 9x9 grid. Once (and if!) you have somehow managed to solve all three of the jamo sudokus, you are in no way done. Each square of the 9x9 grid will then contain an initial, medial, and final jamo—the final step of the Monster Lingdoku is to merge the three jamo in each square into a single Hangul syllabic block. Please note that while all the usual sudoku rules apply for the separate initial, medial, and final jamo puzzles, there are no particular constrains on the arrangement or distribution of the final merged Hangul characters in the rows, the columns, the 3x3 blocks, or the entire puzzle. Supposing you haven’t already run screaming from the room—crying to your mommy, your therapist, or your thesis advisor—and you actually have the mental fortitude to complete the puzzle, you should go ahead and email your solution to SpecGram. At least one random winner chosen from among those who send in correctly completed puzzles by October 15th, 2007—though there may well not even be the one—will be awarded at least one SpecGram magnet. A solution (close enough to the correct one to do in a pinch) and the name of the prize winners (if any) will appear in the upcoming November issue.